It looks like the plastic bottle is here to stay, despite publicity about bisphenol A and other chemicals that may leach into liquids inside the bottle. Plastic bottles (which had been used for some kind of consumer product) are the feedstock for what is known as “post consumer recycled polyester”. Recycled polyester, also called rPET, is now accepted as a “sustainable” product in the textile market. In textiles, most of what passes for “sustainable” claims by manufacturers have some sort of recycled polyester in the mix, because it’s a message that can be easily understood by consumers – and polyester is much cheaper than natural fibers. The recycled market today has lots of unused capacity – as well as great potential for growth, because the recycling rates in many high consumption areas (like Europe and the USA) are low but growing. In Europe, collection rates for bottles rose to 46% of all PET bottles on the market, while in the US the rate is 27%. Factories are investing in technology and increasing their capacity – so the demand is huge. According to Ecotextile News, beggars in China will literally stand watching people drink so that they can ask for the empty bottle. As the size of the recycled polyester market grows, we think the integrity of the sustainability claims for polyesters will become increasingly important. There has not been the same level of traceability for polyesters as there is for organically labelled products. According to Ecotextile News, this is due (at least in part) to lack of import legislation for recycled goods. When you buy a fabric that claims it’s made of 100% post consumer polyester – how do you know that the fibers are 100% post consumer? Is there a certification which assures us that the fibers really are what the manufacturer says they are? And it’s widely touted that recycling polyester uses just 30 – 50% the energy needed to make virgin polyester – but is that true in every case? And what about water use – it’s widely thought that water use needed to recycle polyester is low, but who’s looking to see that this is true? Recycled post consumer polyester is made from bottles – which have been collected, sorted by hand, and then melted down and formed into chips (sometimes called flakes). These chips or flakes are then sent to the yarn spinning mills, where they’re melted down and (if not used at 100% rates) mixed with virgin polyester. A fabric made of “recycled polyester” has a designated percentage of those chips in the polymer. The technology has gotten so sophisticated that it’s now difficult to verify if something is really recycled. The base color of the recyled chips varies from white to creamy yellow. This makes it difficult to get consistent dyelots, especially for pale shades. In order to get a consistently white base, some dyers use chlorine-based bleaches. Dye uptake can be inconsistent, so the dyer would need to re-dye the batch. There are high levels of redyeing, leading to increased energy use. PVC is often used in PET labels and wrappers and adhesives. If the wrappers and labels from the bottles used in the post consumer chips had not been properly removed and washed, PVC may be introduced into the polymer. Some fabrics are forgiving in terms of appearance and lend themselves to variability in yarns, such as fleece and carpets; fine gauge plain fabrics are much more difficult to achieve. And of course, the chemicals used to dye the polymers as well as the processing methods used during weaving of the fabric may – or may not – be optimized to be environmentally benign. Water used during weaving of the fabric may – or may not – be treated. And the workers may – or may not – be paid a fair wage. One solution, suggested by Ecotextile News, is to create a tracking system that follows the raw material through to the final product. This would be very labor intensive and would require a lot of monitoring (all of which adds to the cost of production – and don’t forget, recycled polyester now is fashion’s darling because it’s so cheap!). There are also private standards which have begun to pop up, in an effort to differentiate their brands. One fiber supplier which has gone the private standard route is Unifi. Repreve is the name of Unifi’s recycled polyester – the company produces recycled polyester yarns, and (at least for the filament yarns) they have Scientific Certification Systems certify that Repreve yarns are made with 100% recycled content. Unifi’s “fiberprint” technology audits orders across the supply chain to verify that if Repreve is in a product it’s present in the right amounts. But there are still many unanswered questions (because they’re considered “proprietary information” by Unifi) so the process is not transparent. there is an extensive section related to worker’s health and safety. In the end, polyester – whether recycled or virgin – is plastic. I came across the work of a photographer living in Seattle, Chris Jordan, who published photographs of albatross chicks which he made in September, 2009, on Midway Atoll, a tiny stretch of sand and coral near the middle of the North Pacific. 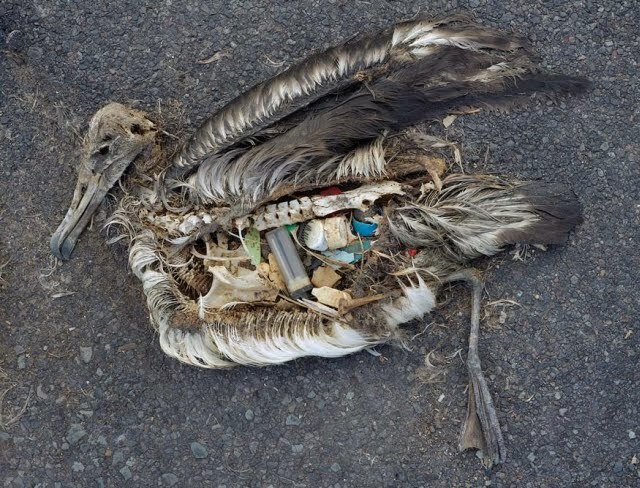 As he says, “The nesting babies are fed bellies-full of plastic by their parents, who soar out over the vast polluted ocean collecting what looks to them like food to bring back to their young. On this diet of human trash, every year tens of thousands of albatross chicks die on Midway from starvation, toxicity, and choking. To document this phenomenon as faithfully as possible, not a single piece of plastic in any of these photographs was moved, placed, manipulated, arranged, or altered in any way. These images depict the actual stomach contents of baby birds in one of the world’s most remote marine sanctuaries, more than 2000 miles from the nearest continent.” See more at Chris Jordan’s website here. To make thing worse, these tiny pieces of plastic are extremely powerful chemical accumulators for organic persistent pollutants present in ambient sea water such as DDE’s and PCB’s. The whole food chain, from invertebrates to fish, turtles and mammals … are eating plastic and /or other animals who have plastic in them. If you’re shocked by this picture, remember that this was brought to our attention years ago by National Geographic Magazine and in reports by scientists from many organizations. One of the things they warned us of is the Great Pacific Garbage Patch, which has doubled in size while we have done nothing. I am shocked that we have done nothing while the cascading effects of our disposable society continue to accumulate. Is recycled polyester fabric RECYCLABLE? Is it true, as one of the leading fabric distributors says of its “green” fabrics made of recycled polyester, that after “years of enjoyable use, these fabrics are recyclable?” Does buying that fabric really help reduce our dependence on a non renewable resource and lessen the burden that plastic is inflicting on our environment? I’d like to show you how this is a misleading statement. It’s a bit complicated, but stick with me because the industry is depending on your confusion. If you know what they’re really foisting on us, you might want to demand a better, cleaner, altogether different product! But first I have to back up and point out that “recyclable” is one of those amorphous words that have no accepted definition. We can “recycle” our fabrics by repurposing them, donating them, use them for quilting or in other ways…but somehow I think they really meant for us to believe that the plastic yarns could be recycled into new and equally beautiful new fabrics: the ultimate “infinite closed loop”. So, the first thing you must understand in order to grasp why this is a disingenuous statement is that there are two ways plastic can be recycled: Mechanically and chemically. Mechanical recycling is the kind that almost all recycling facilities use today. The first step in the process is to collect the plastics and then separate all the different types of plastic (“feedstock”) to avoid contamination – different plastics have different melting points and other characteristics; if they were thrown into the pot together the result would be an unuseable mess. (Remember this fact: the recycling of plastics must always be done with like resins – this will come up later in textiles.) So after separation, each type is melted down and then re-formed into small “chips” or “pellets”. These chips are what a widget manufacturer buys from the recycling facility to make its product – or what a yarn manufacturer buys to make the yarns to weave into cloth. Common misconception about recycling: you might think that if you throw your used drink bottle into the recycling container that it will be recycled into another new drink container. Nope. The melted resin contains contaminants and would not meet food grade requirements, so it is instead destined to go into a secondary product, such as yarn for the fabric we started talking about at the beginning of this blog. A better name for the “recycling container” would be “collection container”. The base color of the recycled polyester chips vary from white to creamy yellow, making color consistency difficult to achieve, particularly for the pale shades. Some dyers find it hard to get a white, so they’re using chlorine-based bleaches to whiten the base. Inconsistency of dye uptake makes it difficult to get good batch-to-batch color consistency and this can lead to high levels of re-dyeing, another very high energy process. Re-dyeing contributes to high levels of water, energy and chemical use. Unsubstantiated reports claim that some recycled yarns take almost 30% more dye to achieve the same depth of shade as equivalent virgin polyesters. Another consideration is the introduction of PVC into the polymer from bottle labels and wrappers. Many yarns made from recycled polyester are used in forgiving constructions such as polar fleece, where the construction of the fabric hides slight yarn variations. For fabrics such as satins, there are concerns over streaks and stripes. Most of the plastics in use today can be recycled but, because mechanical recycling produces a less stable polymer, the products which can be made from this recycled plastic are of “less value” than the original. The products made from the “chips” must be a bit forgiving, such as carpet, plastic lumber, roadside curbs, truck cargo liners, waste receptacles (you get the idea). William McDonough calls this “downcycling”. No matter how many smiling people you see throwing their bottles into a recycling container and “preventing the plastic from entering our waste stream” as the media likes to put it – the reality is that the recycling can only be done mechanically a few times before the polymers break down and the plastic is no longer useful or useable – every time plastic is melted down, its molecular composition changes, its quality degrades, and the range of its usefulness shrinks. So after going from a virgin PET bottle, to carpet fibers, to plastic lumber, to a speed bump – that’s when it enters our waste stream. So recycling plastic doesn’t prevent this occurrence – it just postpones it. Read more about “the seduction of plastic” here. To add insult to injury, if you had bought the fabric mentioned above and hoped the fabric would be recyclable as claimed: probably not gonna happen, because remember how the recycling facility had to separate bottles to make sure each resin was melted with similar types? Think of the fabric as similar to bottles with different plastic resins: many fabrics are woven of different types of plastic (60% polyester, 40% nylon for example), or there is a chemical backing of some sort on the fabric. These different chemicals, with different molecular weights, renders the fabric non-recyclable. Period. And even if the fabric we’re talking about is 100% polyester with NO chemical backings or finishes, there is a problem with recycling in the system itself. Although bottles, tins and newspapers are now routinely collected for recycling, furniture and carpets still usually end up in landfill or incinerators, even if they have been designed to be recycled  because the fabric must be separated from other components if it’s part of an upholstered piece of furniture, for example. Chemical recycling is the alternative technology and it does exist. During chemical recycling, the materials are chemically dissolved into their precursor chemicals. Polyester, for example, would be broken down into DMT (dimethyl terephthalate) and EG (ethylene glycol). These chemicals are then purified and used to make new polyester fiber. But the reality is that this is difficult and expensive to do. Patagonia has made using recycled plastics a priority and gives a good overview of the process with interesting comments about the unique problems they’re encountering; read about it here. Currently, fabrics identified as being “recyclable” really are not – because the technology to recycle the fibers is either too expensive (chemical) or doesn’t exist (mechanical) and the infrastructure to collect the fabric is not in place. Few manufacturers, such as Designtex (with their line of EL fabrics designed to be used without backings) and Victor Innovatex (who has pioneered EcoIntelligent™ polyester made without antimony), have taken the time, effort and money needed to accelerate the adoption of sustainable practices in the industry so we can one day have synthetic fabrics that are not only recycled, but recyclable. So when you buy a fabric made of recycled polyester, remember it’s at the end of its useful life as a plastic – and you are contributing to our dependence on non renewable resources and to the overwhelming burden of non-degradeable plastic in our environment.